In the midst of Fringe madness, the Scottish Chocolate Festival (23rd-24th & 30th-31st Aug) at the Scotsman Hotel made for a sweet alternative to the non-stop comedy and drama of the Royal Mile. The doors were barely open on the Festival’s first Saturday and the place was already bustling. It’s always great meeting enthusiastic business people and this morning a thorough cross-section of eager chocolatiers were raring to go. They were keen to share their interests – and more excitingly, their wares. My first chocolatey encounter was with Hotel Chocolat, whose innovative range is well known and well-crafted. Their best sellers include visually fantastic A4-sized chocolate slabs, formed as the chocolate spreads and cools on marble. I was very impressed by Hotel Chocolat. Ordinarily I wouldn’t give undue attention to a major player at a small event, but their staff provided a lot of insight into the chocolate industry. We were given delicious chocolate batons to try, each of a varying darkness, as we learnt about cocoa butter content. Hotel Chocolat have their own plantation and direct access to cocoa beans gives the company greater control over their chocolate making. They’re one of the few big British chocolate companies that actually do ‘bean to bar,’ meaning they process the cocoa beans themselves. Of the smaller producers we first met Thinking Chocolate, who have a shop on London Road, Edinburgh from which they also run classes. They had a wide selection of chocolates to buy, each of which had been perfectly hand-shaped rather than poured into molds. 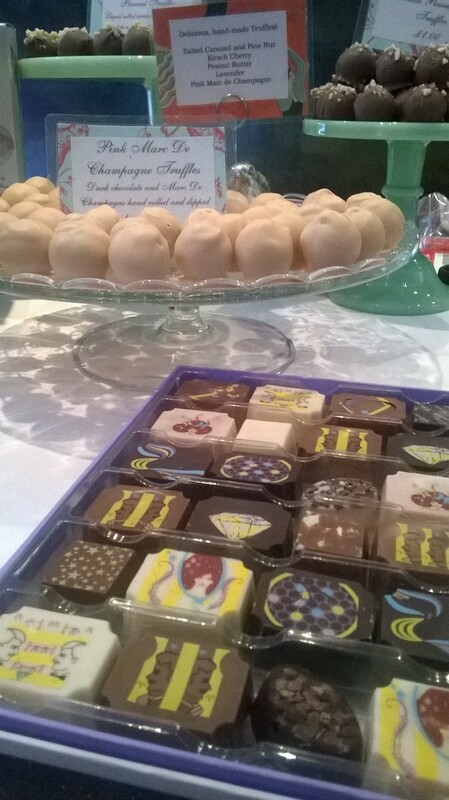 Their popular haggis truffles sold fast, which was no surprise given their delicate spicing, and their gianduja, a soft chocolate mixed with hazelnuts, was a melt-in-the-mouth treat. Blackburn-based Delightful Chocolate was run by the youngest chocolatier present, Alasdair. His brightly coloured fruit-flavoured chocolate buttons made for a cheerful alternative to the dark squares and spheres elsewhere. However, the flavouring lacked finesse. Nonetheless, the cute animal-shaped chocolates aimed at children and the overall quality of the chocolate suggested a lot of promise. 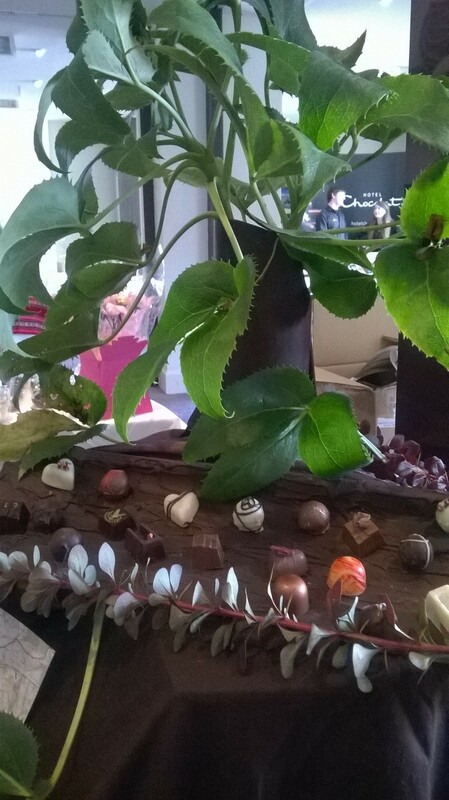 Gorgeous chocolate tree bark from Hello Chocolate! The stand out stall was Hello Chocolate!, whose gorgeous chocolates were displayed on a beautiful piece of handmade chocolate bark. Owner Gill had been an apprentice to a chocolatier as a teenager. After years away from the industry raising her children, she dug out her old chocolate molds and started her own business in Dunfermline. Each chocolate is hand-decorated and seasonally-flavoured, made bespoke for corporate events and hotels such as Gleneagles. Beyond the various stalls there were also demonstrations, talks and ‘Chocolate School’ workshops lead by some of the vendors. The first one, run by Coco Chocolate, was full a good ten minutes before it was due to start. There was also a dedicated children’s activity area. With several tables of chocolate fountains, edible glitter and sweets for decorating biscuits and truffles, it was a popular opportunity to get interactive and messy. Perhaps the only disappointment of the day was the location. Descending four floors to a large room looking across Waverley to the Balmoral certainly made for a grand setting. It was a shame then that the room was a little dark, and sparsely decorated; unable to shake off its function room roots. 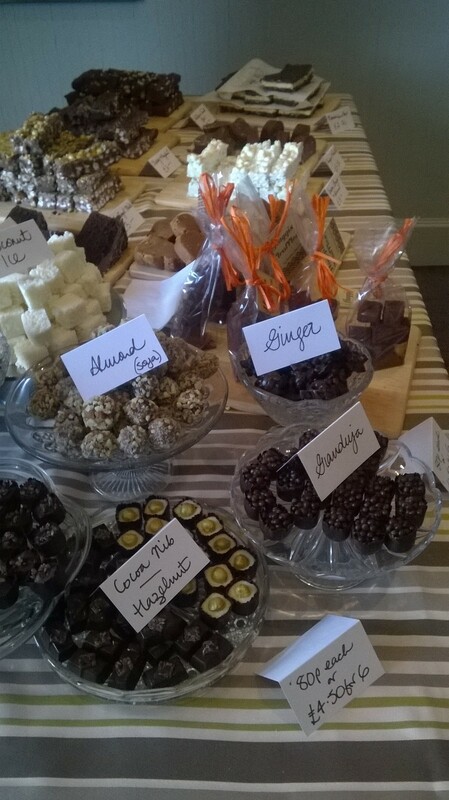 The Scottish Chocolate Festival is held regularly in various Scottish locations. Check out the next festival near you. The Scottish Chocolate Festival on Facebook. Last updated by AmyB at September 13, 2014 . I hadn’t heard of haggis truffles before – I’m intrigued – definitely going to seek them out when next in Edinburgh, thanks.